A Cheticamp pictorial hooked rug from the famed Cape Breton rug community founded by Mrs. Alexander Graham Bell. The quality seems more like needlepoint than hooked, Cheticamp rugs are finely worked with wool yarn, usually hooked in a distinctive inch squares fashion that gives the surface a recognizable look. 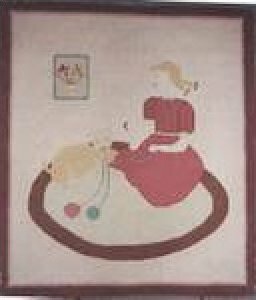 The pigtailied blond girl plays with her pet on a rug in this charming vignette that maybe one of a kind.